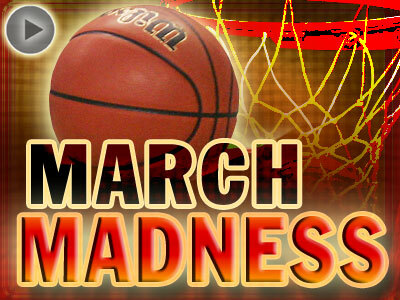 There is no better event in the American sports calendar than the NCAA Tournament. None. Zilch. Zero. And it’s not even especially close. All the games running concurrently, and the one game knockout format, make for captivating evenings of hours and hours of entertainment. This is particularly true of the first round, where action jumps from game to game, and Greg Gumbel struggles to keep up with all the information he’s getting in his ear. It’s like the FA Cup, except it’s better. And I like the FA Cup. Since this post is long enough already, the intro ends here, and there follows a preview (often in the form of a recap) of all 68 of the teams taking part in this, the 2011 NCAA Tournament. In this post: the 17 teams in the Southwest region. Use the following links to skip to relevant parts. Brett McKnight pulling a silly face. They might be relative minnows, but Akron boast some size. 7’0 centre Zeke Marshall is rail thin and fouls on pretty much every possession, but he’s sufficiently mobile to block 2.5 shots per game, and can finish around the basket. The Zips’ best player, Nikola Cvetinovic, is a 6’8 forward leading them in scoring and rebounding, but also an aggressive and fundamental defender on the interior. Reserve forward Brett McKnight is build like a tank, and backup centre Mike Bardo is, if nothing else, big. To go with that, Akron offer a good amount of shooting, particularly from specialists Brian McLanahan and Steve McNees, and the whole lineup is predicated upon the multiple defensive schemes they employ. They should not, however, be an upset threat. 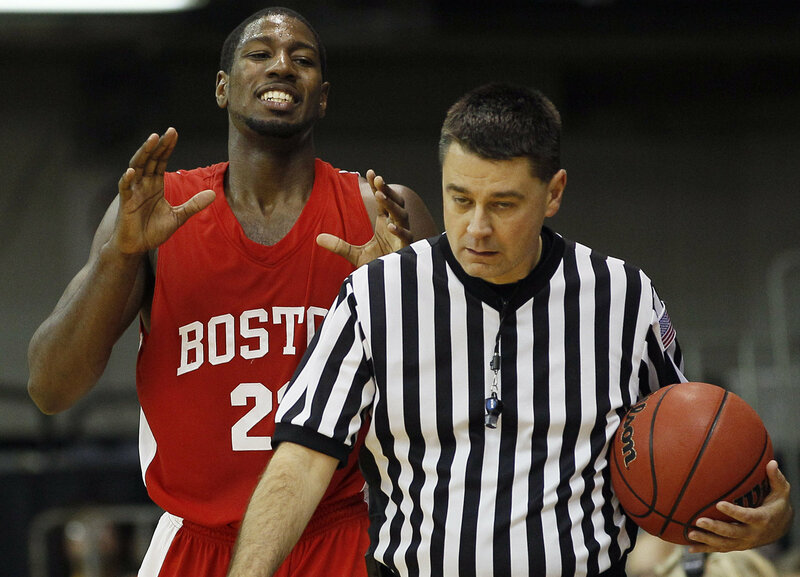 BU’s leading scorer John Holland, eating a massive invisible sandwich. BU come into the tournament on an 11 game winning streak, after a tough non-conference schedule saw them plummet to 10-13 early. 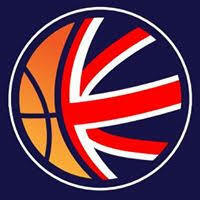 They still struggle to score, however; they score only 65 points per game, and shoot only 40% from the field. Leading scorer (and face of the team) John Holland averages 19.0 ppg, but shoots 39% to do it; 6’6 LaSalle transfer Darryl Partin is second with 14.9ppg, but shoots only 41%. They play decent defense and get a few in transition, yet they are nonetheless comprehensively overmatched. No #16 team has ever won in the NCAA Tournament, and nor will this one. Deividas Dulkys doing an impression of Darius Songaila. Florida State have done rather amazingly well for a team with no point guard, that doesn’t run any offensive sets, and which has missed its clearcut best player for the most crucial stretch of the season. That’s a testament to something, although I’m not sure what. They do it mainly with defense, and that defense is anchored by future lottery pick, Chris Singleton. Singleton is 6’9, very athletic and has long arms, the prototypical body type for a small forward/new era power forward if ever there was one. He combines the physical tools with timing, good hands and good defensive effort, and is one of the best defensive players in the nation. No, check that – he is the best, the single most disruptive individual force boasted by any team in the whole of college basketball. And while he pales offensively compared to defensively, Singleton still does enough on that end to lead FSU in scoring, averaging 13.8 points per game. (No one else scores in double figures, although Derwin Kitchen’s 9.9ppg can probably get a mulligan.) Singleton has improved his free throw and three point strokes, tightened up his ball handling slightly, stopped throwing as many insanely bad passes, and developed a fledgling post game, something he never previously had. He is still not much of a ball handler or shooter, but his physical tools avail him easy looks anyway, and he is dynamite in transition. In addition to Singleton, the Seminoles (arguably Division 1’s best nickname) offer plenty more quality big men. The headline maker thus far this season has been Bernard James, the 26 year old former soldier who only recently started playing basketball, but who quickly proved to be rather good at it. James chips in 8.4 points in 20 minutes per game, shooting .654% from the field, which ranks second in the nation amongst players with enough attempts to qualify. He does this on a series of lefty layups, hooks, and occasional jumpers – James only goes left, and no one seems to stop him doing so. Offensive productivity aside, BJ is best served as a rebounder, and as an active, athletic and strong interior defender. 6’8 sophomore Terrance Shannon plays much the same sort of game as James does, except without the size or the touch. 6’11 junior Xavier Gibson is the best prospect of the lot, although the overdue breakout he began earlier this season was stalled due to injury that he has done well to come back from. As is often the close with the Seminoles, Gibson is big, athletic and intriguing, although his affinity for a not-very-good jumpshot is clearly taking preference to learning how to create and finish in the post. And behind them all is yet another monster of a man – 7’0 junior Jon Kreft, who’s built like an old Joel Przybilla yet who fouls like a young Joel Przybilla, and who once got done for cocaine possession. Whilst none of these players have realised their full potential yet, there are a relentless number of options here. With all that size, it is no great wonder how FSU rank 13th in the nation in rebounds per game. Offensively, however, they often encounter problems. Singleton is the leading scorer, but considering his limitations on that end, this is reflective of the problem. There is little to no dribble-driving going on, nor any guard who can create his own shot. Starting point guard Derwin Kitchen does his best to be a facilitator, but it doesn’t come naturally to him. Like most of the roster, he is a defensive specialist, tall and athletic for his position, a great rebounder with good hands on defense, who just doesn’t have much offensive fluidity. He is efficient, a willing passer, a decent mid-range jumpshooter and a transition finisher, but he just isn’t a point guard. Designated Lithuanian shooter Deividas Dulyks is similarly limited; slightly bigger than Kitchen, he plays scrappy, energetic, unathletic defense at the two guard position, but offensively is largely limited to catch-and-shoot jumpshots. And, frankly, he’s not that good of a catch-and-shoot player. Kitchen’s backup Luke Loucks is a big point guard with some court vision, but his individual offense and athleticism are lacking, and he turns it over far too much in usually infuriating ways. And while 6’4 wing Michael Snaer is a former McDonald’s All-American, he has not lived up to that billing. His forays to the rim often result in turnovers, and he is a fairly average jumpshooter. The offense hasn’t been as bad as expected, however, and has improved during the season, in part due to the contributions of the freshman James, Ian Miller and Okaro White. Miller has missed some time with injury, yet when he’s been healthy, he’s been Florda State’s best backcourt scorer, the best guard shooter, the best guard at creating in isolation. He is an athletic combo-guard, great transition player, and, predictably, a player with good defensive potential as well. Meanwhile, White is an athletic and versatile 6’8, vaunted initially for his defense (obviously) yet proving effective as a mid-range-and-in offensive player, too. He can score in the post, and is good enough of a ball handler to be effective at throwing himself wildly towards the rim, albeit with high turnover numbers as an inevitable by-product. The incoming class of White, Kreft, Miller and White have supplemented the defense, given then enough of a talent infusion to overcome the offensive flaws, and pushed the Seminoles back into the tournament. As for who they turn to into the clutch? Let’s find out. Mercifully, that’s Austin Freeman’s mouthguard, not his teeth. The Hoyas enter the tournament having lost five of their last 6 games, their only win coming over Big East minnows South Florida. Before that stretch came an eight game win streak, including victories over Louisville and Syracuse. This is due in no small part to Chris Wright’s broken hand. Wright, a future D-League all-star, is a very good defensive point guard; quick, big and athletic, with decent hands and a good effort level. He can also get to the basket, is a good drop-off passer, and has an improved three point jumpshot, albeit with almost no mid-range game. Alongside him, Austin Freeman has become one of the nation’s best shooters, and although he’s not particularly great at creating these jumpshots for himself, he doesn’t need to be at this level. Freeman has up to 25 feet of range, knows when to use it, has a mid-range game, and when defenders play him close for the jumper, he can get to the basket and take some contact with all that strength of his. By being rather slow and unexplosive unless given a running start, he projects as something of a possible defensive liability at the next level, and this isn’t helped by his being unspectacular off the dribble and undersized. Yet that shooting is a skill that can translate anywhere. Those two are the foundation of the team. Alongside them are some useful role players. Jason Clark is a pesky combo guard defender with a good jumpshot, an undersized two without point guard abilities, but with the speed and smarts to contribute on both ends. If he can greatly improve his handle and make fewer turnovers, even better. Julian Vaughn has a strong rebounder and shotblocker, who plays exclusively in the paint on either end and who has developed an offensive game, mainly righty hooks over the left shoulder and a spin move. Alongside him, freshman Nate Lubick is a high-IQ, low mistake big man, with some strength, toughness, passing vision, good hands, hustle, acceptable defense, and an inside/outside offensive game that will be much more evident next season. Hollis Thompson has been stuck with playing the power forward position for stretches when he is unquestionably a natural three, but he has also prospered into an excellent shooter, hitting 44% from downtown and giving forth valiant effort on the glass and interior defense, despite the matchup disadvantages. Henry Sims can rebound, pass, run the court and block shots, or he can throw the ball away, commit silly fouls, drop passes and constantly get caught out of position on defense, depending on what day it is. And Jerelle Benimon, while rather unreliable at this point, contributes some athleticism and defensive depth. Georgetown will only get anywhere significant if they have Chris Wright playing. It is not so much to do with Wright’s own abilities; it is more to do with what he brings that they can’t get elsewhere. Freeman has become one of the best shooters in the country, but he’s not particularly good at getting his own shot. Clark does even less of it. Lubick and Sims are both good passers for big men, but someone has to get them the ball first. Backup guard Vee Sanford can be a spark off the bench on both ends of the court, yet the only shots he creates are his own. This is where Wright’s necessaryivitiness becomes manifest. Georgetown have improved on their depth from last season and can be realistically expected to go as much as ten deep on most nights, but they only have one Chris Wright. They only have one dominant ball handler, half-court creator, on-ball leader and dynamic influence on both ends of the floor. If Austin Freeman has to do it all, he’s going to shoot 5-17, and the Hoyas are going to suffer a first round defeat. With Wright in place, though, they’re a Sweet 16 calibre team. Wright has said he will play, but if he’s still injured and thus ineffective, then that doesn’t really help. Illinois are somewhat lucky to be here after a typically up-and-down season that, luckily, was carried by some good non-conference wins. They struggled all season with inconsistency, including a worrying amount from their senior class, who did not exactly lead by example. Star point guard Demetri McCamey averaged 6.1 assists per game, good for 13th in the nation, and on paper at least continued the good work he began when he broke out last season. But he has been lambasted for poor leadership, discipline and work ethic, supposedly disinterested in leading the team due to his NBA aspirations, and being benched for these things on more than one occasion. This is particularly haphazard for McCamey given that his NBA aspirations aren’t really that great – he may well get drafted, but it’s on talent alone, and certainly not on conditioning. McCamey has great passing vision, is willing to pass first, can push the ball or get to the rim in the halfcourt, and has developed into a fantastic three point shooter. But he’s slow, perennially out of shape, has absolutely no mid-range game, is inconsistent, and is a liability defensively, far more so at the next level than at this one. And he’s already a liability at this one. The senior front court of Mike Davis and Mike Tisdale has also rather underwhelmed. Davis, whose calling card for three years was his great rebounding rates and automatic double-doubleness, has decided not to do any of that this season, and is averaging less rebounds now than he did as a sophomore. He has decided to not shoot every time he touches it now, which has helped his efficiency and his passing numbers, but Davis remains a thin, perimeter-based face-up power forward who rarely drives, doesn’t create in the post, almost never gets to the foul line, can’t defend anybody, and who takes long two point jumpers and 18 foot hook shots, the most inefficient shots in basketball. Tisdale has had similar problems – he has continued to work on bulking up, and has become normally thin (as opposed to worryingly emaciated, like he used to be), but it hasn’t really changed anything. He is still abused in the interior on both ends, and would rather use his 7’1 height to camp out shooting jumpshots. At least he brought some three point range this season. The Illini’s most impressive player may have been freshman Jereme Richmond, a man with the textbook physical profile for the wing positions. Richmond is 6’7, 205lb and a hell of a leaper, and has used these tools to blossom into one of the nation’s best freshman defenders. He also chips in 5 boards in 20 minutes per game, runs the court, passes well, doesn’t make as many mistakes as you might imagine, and gets open off cuts for looks around the basket, where he’s a decent finisher within about 10 feet. He can learn to dribble in traffic and shoot with range later; right now, he’s maximising a limited skillset. Fellow freshman Meyers Leonard has shown some scoring ability for one so big, but makes plenty of mistakes, and has a little bit too much of softness about him at the moment. A summer in the weight room is much needed. The only other players in Illinois’s rotation are senior role player Bill Cole (whose job is to hit open threes, rebound, and not make mistakes, two of which he regularly achieves), and sophomore guards Brandon Paul and D.J. Richardson. Both have rather underperformed as sophomores after promising freshman seasons. Paul is slightly more selective about his shot selection and continues to play decent defense, but he still has many a wild moment, and struggles rather a lot inside the arc for one so athletic. Richardson, it appears, has forgotten how to dribble, and suffered the rare ignonimity of his numbers going down across the board from freshman to sophomore seasons. The problems of the duo are representative of Illinois’s struggles as a whole. They were tipped for a lot more than this. Amidst a disappointing season, the Illini scraped their way to the tournament, an improvement on last year’s disappointing season at least. All things considered, though, a deep run does not look likely. If Markieff wasn’t noticably taller, there’d be literally no way of knowing. Kansas lost Sherron Collins, Xavier Henry, C.J. Henry and Cole Aldrich from last season, four fifths of a pretty awesome starting five. They didn’t do a whole lot to replace them; Josh Selby was the only incoming freshman of note, while Mario Little and Travis Releford returned from voluntary redshirts. That was about it. And yet despite it all, Kansas are just as good as they were last year, if not better. 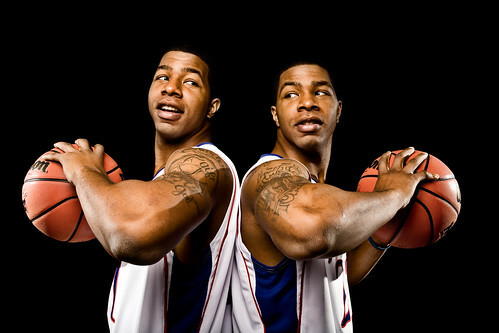 This is mainly because of the Morris twins. Quite simply the most facially identical pair of twins that have ever walked the Earth, the Morris’s have slightly different games that have become extremely complimentary towards each other. Markieff, slightly bigger, is the better rebounder and post defender with a better trailer three; Marcus, slightly better, does more creating on offense, defends the perimeter better, and has the better mid-range game. Both are good sized, decently athletic shot makers, with high IQ’s, good court vision, spin moves, good hands, and versatility on both defense and offense. Both are future NBA players, too. And not just future NBA players like the Collins twins; the Morrises can play. The third big in Kansas’s three man rotation is Thomas Robinson, who has improved beyond all recognition this season. Last year, Robinson was a very athletic player with more potential than production; this season, he’s learnt to use those tools. Robinson runs the court well, and has learnt to create from the mid-range and all, driving the ball to the basket and using his considerable athletic advantages. Robinson retains the shot blocking and rebounding tools of before, whilst now bringing this offensive game, and adding a jumpshot with some range. This is an impressive sophomore and a future NBA player, with shades of Marcus Haislip about him. In a good way. At this point, the only thing Josh Selby does consistently is shoot, and he undermines that strength with an inconsistent release point and over-confident shot selection. Selby is not good at making shots around the basket at this stage in his career – which doesn’t stop him trying – and his defense can be as wild, exasperating and damaging as his offense when it’s similarly unchecked. That said, he is the Jayhawks’s best guard option for creating his own shot, and, on his day, the best jumpshooter on the team. He is the polar opposite of Brady Morningstar, senior role player with bad facial hair, who is a ball mover, secondary ball-handler, extra passer, unathletic if effective defender, and reluctant shooter. (White role player at powerhouse school, rarely shoots, plays defense, Big 12. Excessive Bob Knight and Brent Musburger love was inevitable.) Travis Reed functions as the unathletic, well-intentioned spot-up shooter and extra-passer. (Same Musburger-related problem here, too.) Releford used his redshirt season to calm down and stop making so many mistakes, and, with an improved jumpshot, provides an athletic scoring guard option off the bench, particularly effective in transition. And Mario Little, a junior college transfer trying desperately to reform from undersized power forward into wing player, has developed a jumpshot with which to greater achieve that aim. He could stand to take a few less of them, however. If you include Jeff Withey – the capable 7 footer who would be a lynchpin in a lesser program, yet who barely gets off the bench for the Jayhawks – then Kansas are 11 deep. They are particularly deep in the backcourt, so much so that Elijah Johnson – a high quality guard with very good defense, jumpshooting, size, athleticism and open court play who is probably better than both Selby and Releford – struggled to find minutes until Tyshawn Taylor was suspended. Taylor himself is worryingly inconsistent for a junior; athleticism and defensive potential aside, he still hasn’t developed a great perimeter jumpshot, combines the occasional good floor game with a series of unforced turnovers in other games, and mingles in elite finishing ability with the a bewildering knack for missing layups. Taylor has had ample opportunity to make the lead guard spot unequivocally his this season, yet he hasn’t done so. He can change that with a strong tournament showing, yet basketball IQ is not easy to learn in a week. With so much depth, though, the Jayhawks can offset any bad night by Taylor, or the nightly struggles of any guard they have. Kansas may lack that one true high quality star guard that seems somewhat of a pre-requisite to be a true national title contender, but they have plenty of talent, plenty of options and plenty of depth. On any given night, they can find someone in the backcourt who will play well enough to plug the gaps. And on every given night, the Morrises will produce. One of them looks happy. Not an awful lot was expected of Louisville this season, due to a lack of blue chip recruits, no returning starters, and no clear-cut future pros/go-to offensive players. But it appears Rick Pitino knew what he was doing. Rather than load up on stars, they just loaded up on players. Now, the Cardinals run 11 or 12 deep, and pressure the bejeezus out of you. In the backcourt, Preston Knowles (now a senior, and the only one on the team) is the leading scorer at 14.8 points per game. It is, of course, mostly done via the three pointer, because that is what Preston Knowles does. He has not developed into much of a ball handler – he just sticks to what he knows. Threes, getting open for threes, and defense. Sophomore Peyton Siva plays the point, and despite his age, he’s already better than Edgar Sosa ever was. He is very athletic, has plenty of flair, good ball handling skills, relentless defensive pressure, the ability to get to the basket, the touch to finish when he gets there, decent court vision, and a willingness to share it. Louisville are third in the nation in assists, and Siva, with his 5.3 per game, is a large part of why. If he can now learn to shoot and maybe grow five inches, that’s even better. (Behind him, pass-first freshman Elijah Johnson doesn’t play much.) Also at guard, J.R. Smith’s brother Chris Smith, a transfer from Manhattan, has become a vital all-around player – big, strong, aggressive, defensive, rebounding, facilitating, shooting, and basically playing nothing like J.R. Junior forward Jared Swopshire has not played all season, and Rakeem Buckles’s good season was ended early by injury. This has left a void in the forward rotation, one largely filled by extended minutes for Stephen Van Treese and George Goode. Van Treese so 6’9 and rotates defensively, which, even if it’s about all he does, is enough. Goode does much the same sort of thing, while also fancying himself as a shooter. In addition to those two, Mike Marra and Kyle Kuric play big minutes, using their similar physical profiles to play decent defense and contribute as off-the-ball role players on offense. But there’s one big difference between them. The two are both good outside shooter, but Marra is too aggressive offensively, and Kuric is too passive. There’s a 20% difference in their shooting percentage that reflects that, and it’s only Mike Marra who doesn’t realise that 157 threes in a season is too many when you hit only 29% of them. (Pitino has often stated his relentless confidence in Marra’s shooting. And that’s fine. But some up-fakes and extra passes every now and then would help a lot.) Because of this, Kuric is a valued role player integral to running of the team, while Marra, unless he’s hitting the shots he’s taken anyway, rather hurts it. At centre, Terrence Jennings has elements of Jerome Moiso about him. He is an important, productive, athletic and versatile centre…..sometimes. And then sometimes, he’s a no-show. Jennings can outrun any centre when he chooses to, can finish around the basket, block shots, rebound, and pass better than his numbers suggests. But these things are mainly predicated on athleticism and effort, which he doesn’t always give. In stark contrast to this, his backup, freshman, Gorgui Dieng, never lacks for effort. Dieng plays much like Jennings – the athleticism, the rebounding, the shot blocking, the ability to change a game primarily due to little more than physical profile. He doesn’t have the abilities of Jennings to finish in any way other than a dunk, occasionally spot-up for a jumpshot or pass, but then nor does he have the same lack of motor. Dieng is as exciting of a prospect as Jennings once was, maybe more so. Time will tell if he projects the same way. Despite being ostensibly short-handed, Louisville are 37th in the nation in scoring. Their systematic approach, built around depth and relentless pressure, has so far shown itself to be capable of beating anyone. That won’t stop now. Morehead State consist of Kenneth Faried, and then a bunch of other players. Faried is the best rebounder in the nationa, and it is not even especially close. He ranks first in the nation in defensive rebounding percentage, ranks first in offensive rebounding percentage, and just broke Tim Duncan’s all-time Division 1 rebounding record. Duncan grabbed 1,570 in his NCAA career; Faried has 1,648 and counting. He scores, too, improving both his jumpshot and his interior finishing, putting up 17.6 points per game and shooting 64.4% from the floor. And then there’s the 4.4 stocks per contest. The other guys are headed up by Demonte Harper, not a bad rebounder himself, a small scoring guard and pseudo point guard with a worryingly huge turnover rate. But despite Harper’s 16 points per game, it is, nonetheless, still all about Faried. For all of Kenneth’s Rodman-like contributions, Morehead State lack a point guard, can’t shoot a foul shot, have no real size (Faried has a small forward’s body), don’t defend the three, turn it over too much and can’t hit a foul shot. This season, then, will be much like the last time they made the tournament in 2009 – a quick first round exit, highlighted by Faried’s awesomeness. So, that’s that out of the way. 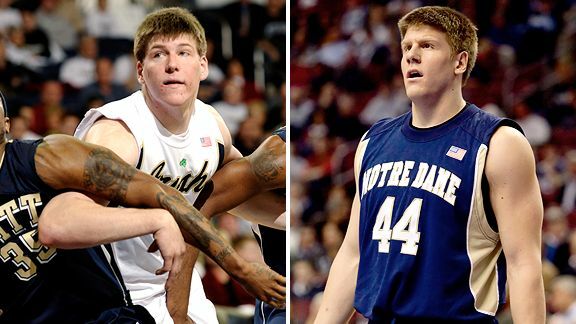 The Irish aren’t deemed to be worthy of a number 1 overall seed, but they could be. They are an old, experienced, enthused and relatively mistake-free team that doesn’t want, need or use much depth. They go up to 8 deep, and use 7 most nights, but for the most part, it’s a clearcut six man rotation. That rotation is led by Big East player of the year, Ben Hansbrough. Ben plays as hard as Tyler, and is fearless, despite his small size and lack of athleticism. He has developed into a capable two-way combo guard, a good passer and leader, an aggressive defender who gives it whatever he has, who’ll take on whoever is between him and the basket regardless of the mismatch, all while becoming one of the nation’s best shooters. Mike Brey likens him to a right handed Manu Ginobili, and he has a point. Hansbrough doesn’t have Ginobili’s size, athleticism, flair or sheer talent level. But there’s similarities there; the effort, the versatility, the dexterity, the shooting, the passing, the gumption. And the pigment. Hansbrough is joined in the backcourt by freshman point guard Eric Atkins, the lone underclassmen in the six man rotation. Atkins started the season well, but has tailed off recently, putting up little more than fouls down the stretch of the Big East season. Yet he has nonetheless shown great pose for a freshman, defending well, sporting an incredible 2.7:1 assist/turnover ratio, and shooting jumpshots better than advertised. Apart from the bit where he got arrested before his freshman season had even begun, Atkins has commanded a lot of trust early, and bumps Hansbrough down to the shooting guard spot when he’s in the game. This in turns bumps Purdue transfer Scott Martin down to small forward, his more natural position. Martin is a big wing and a decent athlete, even in spite of the injuries, whose main virtues are toughness and defensive effort moreso than offensive skills. The only other guard off the bench, 6’6 sophomore Joey Brooks, can be effective at times by throwing himself wildly at the basket. However, he barely played once conference season began, and is one of the nation’s least-used 8th men. Up front, Notre Dame doesn’t have a great deal of size. Power forward Carleton Scott and centre Tyrone Nash both have the frame and athleticism best suited for small forwards. Yet this doesn’t prevent them from their significant defensive impacts. Scott uses his good athleticism to be the team’s best shot blocking presence and a good defender of perimeter forwards, while Nash uses energy and effort to play good post defense on those far bigger than he. Nash can also make shots around the basket, drive from the high post, and expand the playbook with his great passing game, while Scott plays on the perimeter, running the court and hitting three pointers. Once they leave here, both will make some money in the professional game. Starting small forward Tim Abromaitis, meanwhile, enjoys a size advantage for his position. Standing 6’8 and 235lbs, Abromaitis is best as a shooter, although he can also take slower forwards off the dribble as well. He is second in points on the high-scoring Irish team, and has decided to try and rebound this season, pulling down an acceptable 6 boards in 34 minutes per game. Abromaitis is less athletic than Ravern Johnson or Linas Kleiza, and smaller than Chandler Parsons, but he’s bigger than Jimmy Butler, and a better shooter than Joe Trapani. Like the aforementioned Nash and Scott duo, he will make some money in the professional game. Mike Brey likes to do it with older guys – if that makes sense – and this year represents his most successful season to date. They could have been a legitimate number 1 seed, and perhaps should have been. As it is, they’ll have to settle for number 2, and an easily rolling-over of the Akron Zips. Northwestern guard Juice Thompson cops a feel of E’Twaun. Every single player on Purdue can defend. The two wing players, D.J. Byrd and Ryne Smith, are essentially interchangable – strong, rugged, well-built fairly athletic 6’5 defenders and shooters, who chip in with the rebounding load. The same could be said of backup big men Patrick Bade, Travis Carroll and Sandi Marcius, all space eaters who grab a few rebounds and who aren’t allowed to shoot unless it’s wide open. That’s half of the rotation stereotyped already, and backup combo guard Kelsey Barlow is much the same. The biggest and most athletic of all the guards, he is best defensively, able to finish in transition, but without good ball handling or jumpshooting abilities, and a turnover waiting to happen when he’s trying to drive through traffic. All of the rosters defends; half of the roster doesn’t score. None of those defensive role players can create much offense for themselves. Backup guard John Hart has fallen out of the rotation towards the end of the season, but he represents an outside shooting threat off the bench. Freshman wing Terone Johnson doesn’t have Hart’s shot, not a whole lot of shot selection, but he can get to the basket on occasion. Yet pretty much all the Boilermaker’s offense is dependent upon three players; E’Twaun Moore, JaJuan Johnson and Lewis Jackson. Johnson has one of the best years of anyone looking to bolster their draft stock. He has gone from being an athlete and a good shooter, to a complete go-to player. Johnson scores 20.5 points in 35 minutes per game, and does it almost exclusively in four different ways – open court dunks, pick-and-pop jumpshots, turnaround jumpshots, and rangy right handed hooks over the left shoulder. He uses the middle two far more than the rest. If creating in the post, Johnson’s going to either use the righty hook, sometimes the very rarely used lefty hook, or the turnaround jumpshot. And it’s probably the latter. He doesn’t dribble drive much, preferring instead to take jumpshots there as well. And because of his great physical profile – 6’10 and incredibly athletic – no one is blocking these jumpshots, which is why he can always default to them. The quality of the jumpshot, and his judicious use of it, have turned him from a good sorer into a star offensive player. Furthermore, Johnson is a good shotblocker who can be easily outmuscled on the interior, but who contests fairly well on the perimeter, and he’s even put forth slightly better effort on the defensive glass this season. He has done a lot for his stock, and is in exactly the right era for his skillset. Moore’s biggest improvement from last season to this was in his three point stroke, which went from decent to quality. The downside to that, as is so often the case, was that Moore began to use it too much, going away from the crafty agile inside-the-arc slashing game that had gotten him that far. But Moore has rather struck a balance now between the two, and is the team’s most important perimeter player. He will take on guards bigger than he, both offensively and defensively, can score in isolation, does not take bad shots, and can create space for himself through body control, a decent handle in traffic, and decent agility. It’s a somewhat unconventional game he plays, yet that works only to his advantage. Purdue are kind of boring – no offence – but they are indisputably good. If they had Robbie Hummel, they’d be a Final Four team. Who knows? They may be one anyway. Richmond are here because they won the A-10 tournament. Had they not done so, they might have struggled for an at-large bid, but an 8 wins from their last 9 games streak saw them climax at just the right moment. (Giggidy.) As it is, the Spiders now make their second consecutive tournament, doing so with much the same personnel. Richmond’s best player, leading scorer, rebounder and shotblocker this season has been upcoming draft pick Justin Harper, who does a fine impression of a lesser JaJuan Johnson. Like Johnson, Harper is an athletic face-up power forward, whose offensive game is built around his jumpshot. He can hit this shot from post-up situations while turning over either shoulder, or in catch-and-shoot situations, and already has more range than Johnson. He has similar concerns to Johnson with regards to his lack of strength and toughess, his poor defensive rebounder numbers, and his rather pedestrian dribble-drive game, but the comparison I’m forcing on you is nonetheless valid. Where he trails Johnson, other than being slightly smaller and slightly less athletic, is in the lack of counter moves. The other big time scorer is 6’0 senior scoring point guard, Kevin Anderson, a highlight waiting to happen. Anderson has a great handle and loves the crossover dribble, is athletic and quick, able to get to the basket, armed with a floater, thriving in transition, and with a much improved three point jumpshot. Anderson always had a good two point jumpshot, and has stretched that range out as a senior, making him a more versatile offensive weapon. He is only a point guard because his size and handle, not because of his mindset or passing skills, and his slender size means he struggles around the basket, yet despite said size, Anderson’s speed and quick hands make him a presence defensively as well. In amongst these two, Richmond features a gaggle of defensive role players. (And yes, “gaggle” is the collective noun for defensive role players. Could also be called a “Madsen.”) Big man Darius Garrett only touches the ball when he’s rebounding it or blocking it out of bounds, and lacks any kind of offensive game; no handle, no shot, no ability to take contact, no passing game, no hands, no strength, and no ability to create. But he’s so effective as a rebounder and a shotblocker that he’s a key contributor for the team anywhere. 6’5 senior Kevin Smith is equally ineffective as a scorer, but his tremendous innate hustle, good anticipation and sufficient athleticism can break up any opponent’s offensive possessions – he’s also a fine passer given the opportunity. Likewise, 6’6 junior Francis-Cedric Martel hustles and helps on defense, with the added bonus of an outside jumpshot to go with it. Elsewhere in the frontcourt Madsen, big man Dan Geriot has lost pretty much all his mobility after serious knee injuries, yet no matter how slow he has gotten, he can still play an inside/outside offensive game with damn fine passing skills to boot. His lack of mobility makes him a tough one to hide on defense, yet the sheer skill level he has also makes him a tough cover, and offense can be run through him. And 6’3 Darien Brothers gives the Spiders a specialist shooting option; combined with the hot shooting of Anderson, Harper and Geriot, all of whom have hit over 40% of their threes this season, the Spiders can regard outside shooting as a strength. The respective improvements by the Anderson and Harper duo are the reason why the Spiders have been able to score more, thereby offsetting the defensive losses by graduating seniors David Gonzalvez (now playing in Austria) and Ryan Butler (not now playing). But both can win you a game, and winning just one game would be an achievement for the Spiders. That one game comes against Vanderbilt, however, who are more than equipped to deal with Harper. On this night, they won’t have a mismatch. Recordingly only 61.4 points per game, St Peter’s score more than only 30 other teams in the country. Shooting only .404% from the field (306th in the nation) and .643% from the line (307th), St Peter’s, as is the case with most of the mid majors winners, do it with defense. That defense is anchored by Ryan Bacon (no word on whether he has a brother called Chris P.) who records 3.2 stocks per game while standing only 6’7. However, 6’7 defensive anchors are an ambitious aim in the NCAA tournament. There’s no obvious matchup for JaJuan Johnson here. If pushed, I’m going to pick Purdue. In lieu of Andrew Darko, here’s Deke and Darko. Alongside Middleton in the front court are finesse big man David Loubeau, an interior scorer with good footwork, moves, effort level and touch, but without any athleticism, who is somewhat soft, and whose name reminds me of the lesbian bar in South Park. 6’9 freshman Kourtney Roberson is somewhat of the opposite to Les Bos; he’s all about girth, strength, effort, rebounding, and pushing people around. Nathan Walkup is the face-up perimeter orientated forward with the outside shot, dribble-drive game, the ability to defend other perimeter orientated forwards, and some good rebounding of his own. And athletic 6’8 sophomore Ray Turner, who gets a few minutes at the back end of the rotation, runs around fouling in a bid to grab rebounds, which he invariably does. What Texas A&M lack, quite badly, is guard play. 5’11 senior B.J. Holmes is the closest thing the Aggies have to a guard who can create off the dribble, the closest thing they have to a half court point guard, and the closest thing they have to a shooting guard, but to annoint him as any of the three requires extreme generosity. For the most part, he’s a three point specialist. Dash Harris is a ball handler and a defender – who, incidentally and worryingly, cites Baron Davis as a mentor – but he offers very little as an offensive player. Yet because of the lack of options, he plays big minutes, and is relied upon even in offensive lineups. Things are so sparse at the guard spots that former walk-on Andrew Darko – who plays decent defense and has an OK outside shot – is now a scholarship player, and the third in a three guard rotation. They also lack for three point shooting – Darko doesn’t offer a ton of it, Harris offers none at all, and Middleton is rather pedestrian from that range at this stage. This leaves Raymond, Walkup and Naji Hibbert as the outside shooting threats. And they’re all a bit too average at it for that. The Aggies weren’t really on the bubble, fairly comfortable winners of an at-large spot. They have enough on their record to be here, they beat the teams they were supposed to beat, and they didn’t have any silly losses (unless you’re particularly unfavourable towards Baylor, whom beat A&M twice). But truth be told, they haven’t beaten any elite teams. Their best win was against Missouri, a decent team, but certainly not elite. And they’ve had ample opportunity to do so, losing to Kansas once, and to Texas three teams. They’re good enough to be here, but, it appears, not good enough to get very far. Florida State, who they meet in their first game, is a tough ask. Especially if Chris Singleton returns from a broken foot, as he claims he might. Chace Stanback, thinking of victims. Built on transfers, UNLV are not the biggest team in the world, and nor do they have any one star player. They likely don’t have a future NBA player amongst them. But they have a talented and versatile 9 man rotation who all play defense and share the ball. UNLV do somewhat struggle with shooting the ball, yet despite that, Chace Stanback has developed into more of a shooter than a driver this season. The 6’8 Stanback has always been a decent slasher, despite his rather ugly handle, and with the jumpshot to now go with it, he becomes a more interesting prospect for the next level. Stanback is also a busy, energetic, active defender, interested rebounder and a talent passer, and is one of the team’s leaders. He’s not the leading scorer, however – that responsibility goes to 6’4 senior guard Tre’Von Willis, who started the season with a three game suspension and a felony domestic assault charge, but has ramped it up nicely throughout the season. “Trey Trey,” who for some reason has no sideburns, moves the ball around, drives to the basket, and is a good passer while doing so, playing decent defense and playing athletic, aggressive defense. He has even improved the percentages on his rather sub-par jumpshot, which he tends to shoot unnecessarily flat. Setting them up is junior point guard, Oscar Bellfield, who does most of the ball handling duties. There is nothing exception about Bellfield, merely a lot of decency. He is a decent ball handler, a decent shooter, a decent defender, a decent athlete and decently sized for his position, with decent points numbers, decent assist numbers, a decent turnover ratio, and a decent pick-and roll game, despite the lack of ideal big man options on the team for that offense. Alongside him is yet another transfer, former Kentucky guard Derrick Jasper, who doesn’t do nearly as much point guard stuff as a Rebel as he did as a Wildcat. Jasper’s role here, as the biggest guard on the team, is to specialise in defense and rebounding, while moving the ball along offensively and finishing alleyoops (of which he seems to get a disproportionate amount). Jasper’s jumpshot and individual scoring capabilities never developed, but he plays a key role here. UNLV are characterised by a pressure defense, which all four of the above are key components even. Another big defensive piece is 6’3 sophomore guard Anthony Marshall, who lacks for advanced ball handling and a decent outside shot, but who is, to put it bluntly, really freaking athletic. Marshall runs round, creates pressure, grabs rebounds, deflects passes and takes charges, a truly disruptive help defensive presence. In terms of big men, UNLV offer Kansas transfer Quintrell Thomas, their best offensive player in the low post and a prolific rebounder, with plenty of upside down the road. Speaking of upside, 6’11 freshman Carlos Lopez has plenty of it – he is really quite thin at the moment and thus limited defensively to the foul, yet he’s getting bigger, learning to play tough, and sports an intriguing height/wingspan/athleticism combination that co-exists nicely with Thomas’s grounded strength. (He’s also a considerably better option on the pick-and-roll, on both ends.) 6’10 junior Brice Massamba doesn’t really do much statistically, but he is at least a space eater, tall and with a great frame, and a little things type of player. The Rebels are certainly rather guard orientated, but they have big guards, small pesky guards, ballhandlers, shooters and athletes. They can give you almost any kind of look. Nikola Vucevic pulls this face all the time. All. The. Time. Perhaps expectedly, all things considered, USC are not a deep team. They weren’t a deep team last season, playing only about 7 players on any given night, and then they got shallower. Mike Gerrity, Marcus Johnson and Dwight Lewis graduated, while Leonard Washington was dismissed and transferred to Wyoming. The Trojans added Fordham transfer Jio Fontan, gave considerably bigger roles to little-used seniors Donte Smith and Marcus Simmons, whilst adding freshman big man Garrett Jackson, and guards Maurice Jones and Bryce Jones. But after only a few months, Bryce Jones transferred, citing a lack of playing time (quite the claim from a freshman getting 21mpg). And now they’re back to only 7 again. The Trojan’s leader is Nikola Vucevic, a talented, productive and versatile 6’10 Montenegrin big man. Vooch is not an athlete, but he’s tall and has developed a strong upper body, which he uses to attack the glass and the rim in equal measure. He can shoot mid-range jumpshots, drive the ball and create in the post, be in the right place defensively, effective from both the high and the low posts, has good hands, shot selection, and passing vision. He has also added three point range this season. How he projects at the next level is a valid question, but as of right now, it’s only important how he projects over the next week. Alongside him, UNC transfer Alex Stepheson – more than slightly reminiscent of his namesake, Alex Oriakhi – is a horse inside. Stepheson is tall, wide,and rather immovable, nailing himself to the post on both ends and proving to be a daunting interior defensive presence. He’s also a good rebounder, good athlete for his size, and a decent interior finisher. On the flip side, Stepheson hasn’t ever really developed offensively; he is clumsy, with bad hands, no J, a bad free throw stroke, no handle, no passing game, and little ability to create in there other than to use strength alone. But he does provide an anchor for the USC defense, much like Gary McGhee does for Pittsburgh. And he does so without fouling. USC do it with defense, giving up only 63 points per game, and Marcus Simmons is a big part of that. Defense is pretty much all he does, but he’s tough, athletic, aggressive and smart on that end, and was the Pac-10 defensive player of the year. The two big men defend, as does Maurice Jones, who is only 5’7, but who is speedy and disruptive. Smith and Fontan do their share, and while freshman Garrett Jackson doesn’t play good defense at this time, he has the size and athleticism to develop on that end. As is somewhat inevitable by a team so strong defensively, USC can struggle offensively; Smith is rather limited to the three pointer, and is a rather poor ballhandler, especially for a 5’11 guard). Jones is not a good ball handler cannot create his own shot and is not a great half court point guard, and Simmons and Jackson contribute little on that end. Fontan is the only guard who can create his own shot, and yet he’s neither great at this nor a great outside shooter. Offensively, it’s all rather dependent on Vucevic. Yet the defense maintains. Due in no small part to their lack of outside shooting, USC are very exposable against a zone defense. They will play VCU in the first round, a good defensive team, but they don’t traditionally do a lot of zoning. They also don’t have enough size for both Vooch and Stepheson on the interior. But it’s an extremely tough game for both teams. 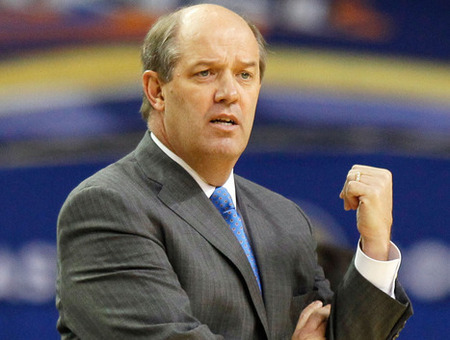 Vanderbilt lost their best big man to graduation over the summer, Australian centre A.J. Ogilvy. Yet despite what should have been a heavy loss, the inside game remains one of their greatest strengths. This is mainly due to Ogilvy’s former backup, Festus Ezeli, who was one of the most improved players in the nation this season. Ezeli has NBA centre size, listed at 6’11 255lbs and looking every bit that size, and plays a true centres game. He is a prolific shotblocker, recording 2.6 blocks in only 23 minutes per game, and is strong, athletic and aggressive. In fact, he’s too aggressive, which is why he only plays 23 minutes per game; he manages to foul 3.0 times a game in that time. Where Ezeli has improved most notably is in his offensive game. Playing exclusively in the post, like the old school centre that he is, Ezeli has developed from being a mere finisher into a decent creator down low, able to get position, create spacing with improved footwork, and drop in the hook shot. The only problem with this is that when the guards feed him in the post, they never get it back. Other than Ezeli, Vandy’s frontcourt options include Steve Tchiengang, a 6’9 240lb tough and pretty athletic post defender who showed up this season with improved range on his jumpshot. He scores little, and doesn’t handle or create, but Tchiengang hustles, moves the ball, plays physically, moans about foul calls, and sticks his jumpshots, now hitting 42% of his threes on the season. 6’7 forward Andre Walker boasts the rather amazing averages of 3 points, 3 rebounds and 3 assists – the redshirt junior has missed much of the season due to injury, as has been the story most of his career of Vandy, but is healthy again in time for the tournament, and does as many little things (and as few big things) as his numbers suggests. Walker can’t shoot threes or dribble, and is physically overmatched at times when pressed into service as a power forward, but he’s a rebounding, help-defending, high IQ, mid-range, face-up point forward. 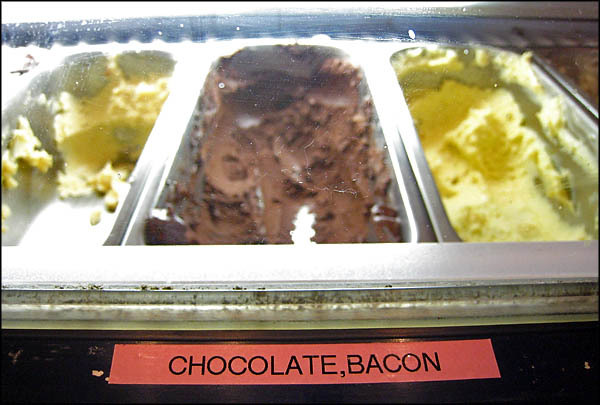 It’s hard not to like that combination. The other major loss, other than Ogilvy, was point guard Jermaine Beal. And his loss was not so readily replaced. Starting off-guard Brad Tinsley has completed the transition to the point guard spot that he began last season, yet he’s more of a ball mover than a creator. He moves it well, keeps mistakes down, is a high IQ player, seems to have rediscovered his jumpshot, and has a knack for old school one handed straight-armed dunks that make him instantly likeable. He is also, however, a shade average. And his backup, freshman Kyle Fuller, can’t be trusted at the moment. Guard play is far from a weakness when you consider that Vanderbilt’s off guard, 6’4 John Jenkins, is one of the nation’s best shooters, averaging 19.5 points per game as a sophomore and shooting 40% from downtown. Jumpshooting is pretty much Jenkins’s only tool, but he maximises its value with decent size, decent athleticism, judicious shot selection, the ability to get open off the ball, the ability to shoot off the dribble, knowing how and when to sell a fake, how to create spacing, and how to get to the foul line with it. With him also in the mix, Vanderbilt lack for neither talent nor versatility. They do, however, lack for an extra ball handler. Vanderbilt will play Richmond in their first game, and should run out comfortable winners. No Spider can handle Ezeli, and with a good defensive matchup for any type of player at any position, there’s no obvious holes for Richmond to exploit either. Even though they lost the CAA championship game to Old Dominion, VCU snagged an at-large bid, in the process ensuring that five Virginian teams made it to the big dance for the first time ever. And yet neither Virginia nor Virginia Tech were amongst them. VCU are led by 6’9 senior forward Jamie Skeen, a versatile and athletic 6’9 somewhat tweenerish forward who leads the team with 15.3 points, 7.1 rebounds and 1.2 blocks per game. Skeen can score around the basket, or face-up from the mid-range area and either shoot the jumpshot or drive the ball via a spin move. He’s also a better passer than his 1.6 assists per game suggest, can hit the occasional three, defends the interior well, and has gotten stronger since leaving Wake Forest. Skeen was dismissed from Wake Forest for “academic rules violations,” which is rather worrying, but that doesn’t matter now. Alongside Skeen, VCU put out a whole host of good defenders, and they like to press. Despite not being especially explosive, 6’6 junior wing Bradford Burgess can defend any position 2 through 4 due to his size and fluid athleticism, and he makes few mistakes on offense in the process. He also rebounds the ball well, can drive to the basket when he has the mismatch, and shoot the three pointer, scoring very efficiently for one without much of a handle. VCU boast another wing with good size in 6’4 senior Ed Nixon, who uses his strength, athleticism and hustle to be a disruptive force on the defensive end, usually drawing the toughest matchups. He also uses that energy to get open off the ball, but he is not much of a shooter and less of a ball handler/creator. Most of the ball handling is done by 5’10 senior Joey Rodriguez, who ranks 58th in the country with 4.8 assists per game, with a decent 2.1:1 assist/turnover ratio. Working on Rodriguez’s favour there is that missed shots don’t count as turnovers – a decent three point shooter, Rodriguez undermines that with occasionally terrible shot selection, and, due to his lack of size, he is little threat inside of the arc save for an inefficient floater. Nevertheless, he moves the ball and runs a good pick-and-roll game, has good hands and energy on the defensive end, serving as the team’s unquestioned, hugely confident, perhaps over-confident leader. Alongside him, 6’2 guards Brandon Rozzell (senior) and Rob Brandenberg (freshman) do most of the jumpshooting, while sophomore backup point guard Darris Theus (not related to Reggie) can push the tempo, although he can’t make a shot himself. VCU are also integrating two freshman big men, 6’9 athlete Juvonte Reddic and 7’0 D.J. Haley, both athletic for their size yet also both very raw at this juncture. 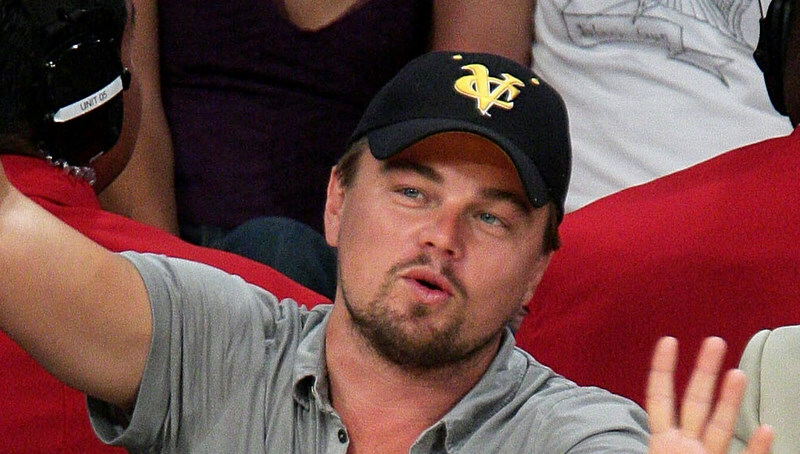 VCU are up against USC in the first round as one of the final four at-large bids. It’s not an ideal matchup for them, because while Nixon and Burgess are fine wing defenders, USC don’t have any fine wings that need defending. Skeen is a good matchup for Nikola Vucevic, but unless Haley or Reddic (or both) exceed anything they’ve done so far, there’s no one to really check Alex Stepheson. And while Alex Stepheson is far from a go-to player on offense, it’ll be a damn sight easier for him to score if Brandon Rozzell is on him. Nevertheless, VCU can win that game.